"How a chance encounter with plastic in the North Pacific Ocean changed my life's work." A third generation resident of Long Beach, California, I grew up next to, in and on the Pacific Ocean. My father was an industrial chemist and avid sailor, taking me and my siblings to destinations from Guadalupe Island, Mexico to Hawaii. My academic pursuits culminated at the University of San Diego where I majored in Chemistry and studied Math, Physics and Spanish Literature. Bourne out of my love of the ocean and its well being, I founded Algalita Marine Research Foundation in 1994 as a scientific and educational 501(c)(3) non-profit, focused on studying and restoring the coastal waters of Southern California. It's beginning and subsequent evolution have been the result of combined efforts by a small group of dedicated individuals with a dream -- preserving our marine environment and breaking the world free from its throwaway mentality comfort zone. Soon after, I became a coordinator of the State Water Resources Control Board’s Volunteer Water Monitoring Steering Committee, assisting in the development of chemical and bacterial monitoring methods for Surfrider’s “Blue Water Task Force” and other NGOs. I later became a member of the Southern California Water Research Projects’ Bight ’98 Steering Committee, providing my vessel as a platform for researchers based in Mexico, enabling the scientific assessment of the entire Southern California Bight from Point Concepcion to Ensenada. In collaboration with scientists from the Southern California Coastal Water Research Project, I developed micro-plastics sampling protocols. These methods are now being applied worldwide as a basic standard for accurate sampling. In 1995, I launched the Oceanographic Research Vessel (ORV) Alguita from Hobart, Tasmania on her maiden voyage. On the way home to California, she was dis-masted in a series of squalls near the equator after leaving American Samoa. A new mast could not be fitted there and we transported aboard a container ship to Long Beach, California where a new rig was installed in 1997. To test this new configuration, I entered the Trans-Pac Yacht Race from Los Angeles to Honolulu, not so much to win a race, but to stress the "rig" for stability and endurance, knowing help would be nearby. Completing the stress test, the return route took the Alguita through the North Pacific Subtropical Gyre. Since we had twin diesel engines and extra fuel, we could motor through the calm, or in sailor lingo, "the doldrums". This is where where I had my first encounter with oceanic plastic pollution -- not continuous scraps as it is now, but stray pieces here and there. I could stand on deck for five minutes seeing nothing but the detritus of civilization in the remotest part of the great Pacific Ocean. As a result of my 1997 encounter with plastic debris in the North Pacific Subtropical Gyre, my research soon changed focus to investigating and understanding the plastics era impact on our oceans. More specifically, in the area sometimes called "The Great Pacific Garbage Patch". Algalita's efforts, data collected on our ten voyages, the International POPS Youth Summits and my global appearances, began a worldwide chain reaction. By initiating the Plastic Pollution Conversation, we have pioneered global awareness of a disaster that begins at home with carelessly discarded waste that ends up in a place called "away". "Away" is no longer just a nameless place....it's our oceans. 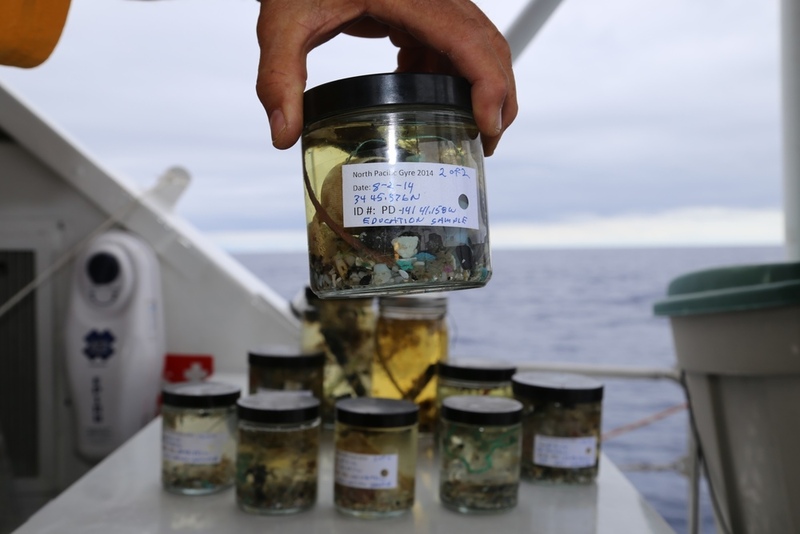 This experience bothered me enough to return two years later in 1999 with a statistically designed sampling protocol to determine just how much of civilizations’ unrecoverable waste was in this area known as the North Pacific Subtropical Gyre. Sensing the potential threat to the marine environment, I decided to dedicate my resources and time to understand and raise awareness about ocean plastic pollution and embarked on my first expedition to study this same area. The findings from this initial 1999 voyage — plastic outweighing zooplankton by a factor of six to one — compelled me to direct my career into this field of research.